New Russian Jet Unaffordable or Not Ready for Prime Time? Is the Russian stealth fighter, the PAK FA T-50, made by Sukhoi, unaffordable or is it an old Renault? That is the question to be asked since the Russian Air Force has ordered only 12 of the airplanes. Either they are flat broke or they are not ready for prime time. The PAK FA T-50 (Perspektivny Aviatsionny Kompleks Frontovoy Aviatsii, “Future Airborne System for Frontline Aviation) reminds me a little of my old Renault 12, which I bought used many years ago and drove for a number of years until my father took it over and drove it for even more. While it was a robust car, and eye-pleasing, when you scratched the surface you found a lot of problems. For example under the dash was a maze of spaghetti wiring; the air conditioning, which was an afterthought by Renault, was a bolt on German system that was poorly mounted and frequently broke; the rubber gaskets deteriorated when exposed to the sun, shedding black stuff, cracking, and failing to provide competent seals. What I can say good about the car is that when the emergency brake failed and the car coasted down a small incline, it slammed into a brick house, making quite a hole in the house but almost zero damage to the Renault. Like I said, it was robust. The PAK-50 is built on a superb basic platform, the SU-35. But the attempt to make it stealthy and to add in a lot of new electronics, seems to be a work in progress. And the engines the new plane needs are not yet ready, and maybe they never will be. Without them the PAK-50 can’t be competitive. Consider that the United States has had stealth aircraft for twenty five years, and has a really great one called the F-22. Maybe the PAK-50 is a real future competitor to the F-22, but Russian industry has a lot of catching up to do and they are not there yet. There are, essentially, three reasons for Russia’s technological problems. These are, first of all, the backwardness of Soviet electronics during the cold war. Isolated from the West, the Russians were way behind in computers and microelectronics. While today they are catching up, they still need to rely on processors from the West. Their microelectronics industry remains far behind even Asian countries. China is far more capable. Where the Russians excel is in design, combat concepts and airframes. 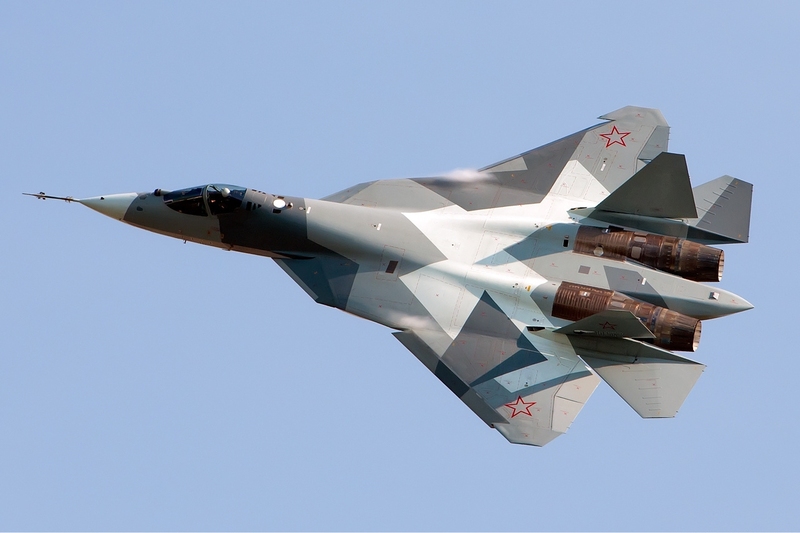 Sukhoi and MiG have proven they can build very impressive jet fighters. Now, since the Syrian war, we also know that they work pretty well in the air to ground mission and as surveillance platforms. Since they operate without any significant air to air threat, we still need to find out if they compete in combat effectively, although the suspicion is very strong they are excellent fighters. The second reason for Russian aviation problems is the lack of investment. During the Soviet period the level of investment was monstrous but despite a huge volume of equipment most of it lagged behind the West. Then for the next ten years after the collapse of the Soviet Union, little was invested in defense by the Russians, meaning that industrial progress was hobbled. It is only in the last decade that the Russians have stepped up investment and emphasis on defense products and production. From that perspective, one can tip one’s hat to the energy and creativeness of Russia’s defense industry. But there is still a long road ahead. The third reason right now is that the Russians have run into development problems and cash flow issues. The development problems have to be expected in trying to institute an entirely new technology and graft it onto existing platforms, a path the US has not followed. So long as the Russians think they need stealth in their arsenal, they have a challenge that will take some years to meet. Meanwhile, money is scarce. The fall in the price of oil is one of the problems facing Russia. But there is much more. Russia’s foreign policy and lack of consumer industry is impoverishing the country. While part of Russia’s foreign policy is aimed at spreading the influence of assets such as Gazprom, in the current political environment and pressure on NATO, Russia is driving away investment and confidence that Russia can be an acceptable economic partner. A lot in Russia’s future depends on how Europe behaves toward Russia. While the Russians may think that jacking up the threat level will bring about deals with the major European countries, especially Germany, there is no certainty that will happen. Europe is in the midst of great political change. While the Russians are trying hard to influence the political outcome in Europe, the Russians are no longer Communists and lack the cadres they once had in Europe (above ground and underground). Now the swing is the other way, and the Russians may not like the forthcoming result. Overall, while Europe itself is weak and disorganized, it has the helping hand of the United States and US air power which, right now and for the next decade, is likely to remain dominant. This leaves the Russians in the hole. They can threaten, they can build new nuclear bunkers, they can fly old bombers around Europe’s periphery, they can move armored forces and air defense systems closer to vulnerable borders, but they would be ill advised to allow any threats to turn into a real conflict. In the meantime the Russians have to solve their old Renault problem. If they want to try and get there solely by concentrating on their defense and aerospace industries, they won’t fix the industrial and technological gaps that persist. On the other hand, if they want to modernize their country, and fix their economy, they can’t go around threatening everyone. For sure, an order of 12 PAKs is not going to turn the tide for the Russians. The United States has 187 F-22s and is about to buy over 2,000 F-35’s, both stealth aircraft. Do the math. I just want to tell you that I’m new to blogging and certainly enjoyed you’re web blog. Probably I’m want to bookmark your website . You surely come with superb articles. With thanks for sharing with us your web page.